Artelia (Madea/Ms. T) McMillian was born December 18, 1924, she was called home to be with the Lord on December 2, 2018. 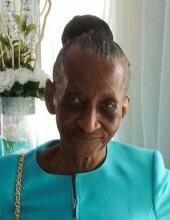 She was a lifelong resident of Mobile, Alabama where she served as a faithful member of First Church of God in Christ. Artelia was a woman of great strength that was cherished and loved by many. Our “Madea” as she was lovingly called by family and Ms. T/Momma T by others was an amazing mother, grandmother, friend and the best baker of sweet potato pies in the whole world she will be truly missed. Artelia was preceded in death by her parents Willie & Minder Coleman, husband Wash McMillian Sr., four children, Wash McMillian Jr., Roosevelt McMillian, Cecil McMillian, and Arlene McMillian. She leaves to cherish her precious memories seven daughters; Georgia Tyree, Joyce Mosley, Kathy McMillian, Carolyn McPherson, Sharon (Kevin) Patterson, Cynthia McMillian, and Delethia (Bobby) Mitchell; three sons; Hardy (Mary), Randolph (Hattie) and Donald McMillian all of Mobile, Alabama; one sister Leanner Hunter; one brother Cornelius (Milee)) Coleman Sr.; a host of grandchildren, great grandchildren, nieces, nephews, cousins’ other relatives and friends.